Apple’s profit of $3.38 billion for CQ4 was slightly more than 10 times bigger than Dell’s $334 million on nearly equal Revenues of 15.7 billion and 14.9 billion. 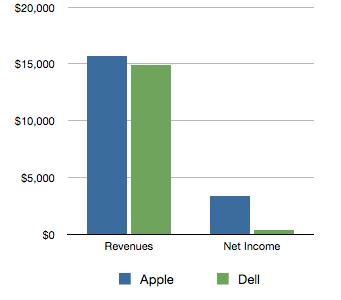 In other words, Apple kept about 20% of its income while Dell kept 2%. Also worth noting is that Dell’s gross margin onconsumer PCs was 0.2% while Apple’s Mac margin (mostly sold to consumers) was around 28%. So on consumer PCs Apple’s margin was 140 times higher. It should not be a surprise then that Apple is worth 6.5 times Dell. To recover some of its margins Dell is rumored to be readying its iPad competitor.